Groton Pacific Carriers, Inc. bought their first folding Porta-Bote for use on their oil tanker, the M/T Hawaiian Sun, about two years ago. They needed a boat that could be passed through small deck openings for easy access to internal cargo tank areas. The boat was to be used inside the internal water-filled cargo tanks for inspection and repair of the tank walls. The 12′ Porta-Bote, which folds to a neat package only 4″ thick and can be passed through an opening only 24″ in diameter, proved to be a smart choice, indeed. Opening the foldable boat takes only a couple of minutes and can be done on a platform as small as four feet wide. Once opened, the boat has a beam of five feet. This wide beam together with Porta-Bote’s unique hull design accounts for the boat’s exceptional stability and maneuverability. “Porta-Bote’s advantages over inflatables were immediately apparent,” says Demetrius Panagopulos, technical manager for Groton. “The boat was found impervious to damage from rubbing against rough steel surfaces, and could not be punctured. We are very pleased with the results”. 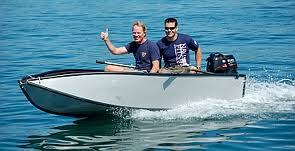 Although in production for over twenty years, Porta-Bote has recently become popular with anglers due to the downsizing of automobiles and the desire for a trailerless boat. In recent years, thousands have been sold to people who have moved to tight quartered condos and apartments and found it impossible to store an ordinary boat. Porta-Bote’s entire hull is made from polypropylene, an engineered resin originally developed for use in the aerospace field. The manufacturer states that the material is unaffected by exposure to salt, acid, gasoline – almost everything. Polypropylene is obviously very tough and durable. The hull is virtually puncture proof and bounces off rocks without damage. The manufacturer is so confident of the durability of the hull material that it is covered by a ten-year warranty. Folding to a mere four inches thick, the boat is easily stored on board a ship or a yacht. It can also be carried on a compact car or side of a motorhome. Porta-Bote also is available in 8-foot,10-foot, 12-foot and 14-foot versions. All are designed to be rowed, sailed, or motor driven. Porta-Bote is available in white, aluminium or duck-hunter green.